Is it wiser to lower your PV system’s capex and O&M, or by adding tracking, to improve its LCOE? “Tracker” is a generic term used to describe devices that orient various payloads toward the sun. In the case of photovoltaic (PV) systems, the payload is the PV module. There is no other single balance-of-system (BOS) component that can increase a PV system’s performance like a tracker. 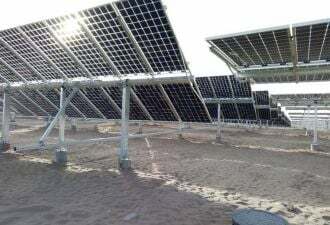 By maintaining consistent direct exposure from the sun to the module, trackers can improve a PV system’s output by up to 40 percent over a ﬁxed-tilt array. The increment of production improvement over a ﬁxed system depends on the project’s latitude and the type of tracker. The benefits of trackers vary between the different categories of trackers (one-axis, 1.5-axis, and dual-axis). By virtue of having moving machinery and requiring a less-dense configuration than ﬁxed-tilt systems, trackers virtually always come at an added cost relative to fixed systems. In order for a tracker to make economic sense, the increased energy harvest must exceed the added cost of installing and maintaining trackers over the lifetime of the system. An additional factor to be considered in the decision to use trackers or fixed systems is land use; tracking systems tend to use additional land because they must be spaced out in order to avoid shading one another as they track the sun. This means that panels must be spaced farther apart, thus increasing land use and land costs for the developer. The other downside to trackers is the operations and maintenance (O&M) cost, which tends to be higher for this category of systems relative to ﬁxed-tilt systems. Given the system’s expected operating life of at least twenty years, O&M costs can add up to a meaningful share of total system costs. The major selection for developers beyond module technology is racking type (ﬁxed-tilt versus tracking). Historically, selecting First Solar modules has entailed the use of a ﬁxed-tilt system. This will change in 2013 and beyond as First Solar vets and deploys its first tracker systems for projects in its pipeline. However, modules from most c-Si suppliers offer the option to choose between the two tracking types. Factors likely to play a role in this selection include land availability, module cost, and O&M. Tracking systems have a larger area footprint per megawatt, so space-constrained areas will be less attractive for trackers. Typical land use for fixed PV can be 4 to 5 acres per megawatt, while a single-axis tracking system will use 4 to 7 acres per megawatt, depending mostly on module selection. This is part of the reason why, historically, thin-film modules have rarely been paired with tracking systems, since the land needed by thin-film technologies is already higher compared to crystalline-silicon modules. However, trackers require fewer modules for the same energy output, so the ultimate comparison for evaluating trackers must account for module cost and tracker cost. Since the purpose of trackers is to increase energy harvest, the relative costs of trackers and modules need to be considered carefully. 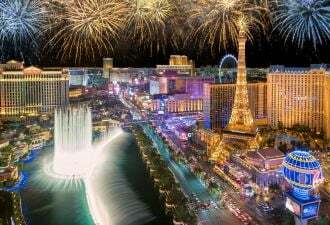 In order to decide which architecture to implement, we need to examine the cost of the system. 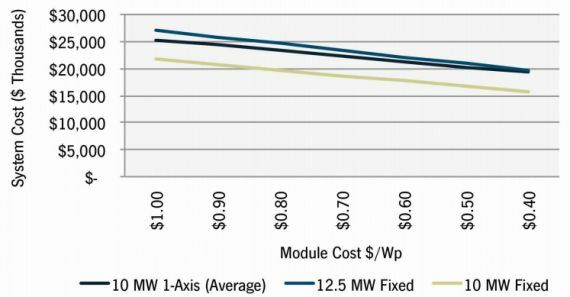 The figure below illustrates the impact of various module costs on total system costs by assuming the fixed-tilt BOS system costs to be $1.17 per watt and tracker cost to come in at a $0.36-per-watt premium. Comparing two 10-megawatt systems, fixed-tilt will be the cheaper option. However, the recent declines in one-axis tracker costs have helped the economics of one-axis tracking tremendously. 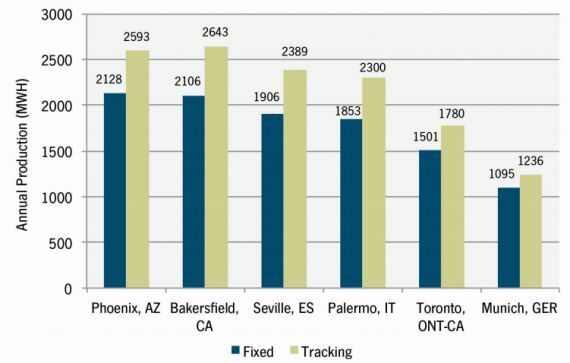 If we consider a Bakersfield, California project, we see that in high insolation areas, trackers can increase project performance by 25 percent. To account for this performance difference, we increase the fixed-tilt project size to 12.5 megawatts. In comparing the 10-megawatt tracking project to the 12.5-megawatt ﬁxed-tilt system, we see that, at current module prices, the one-axis tracker is more attractive. This sudden shift in project economics is the basis behind the rise of one-axis tracking projects in high-insolation areas. 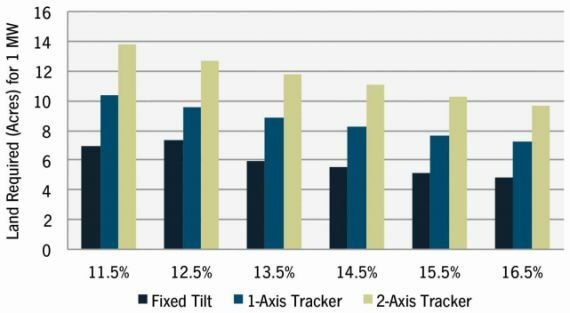 In lower insolation areas, the economic difference between one-axis tracking and ﬁxed-tilt may not be as clear. 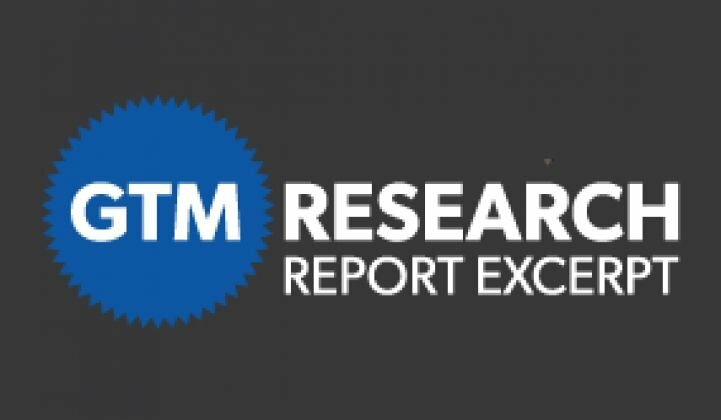 The analysis for this article looks only at upfront costs and does not consider the bankability and financing of tracking systems, nor does it consider the O&M differences, which could tilt the analysis to the opposite conclusion. In Part II of this report snapshot next week, we will compare fixed-tilt and tracking PV systems in terms of O&M costs, end-user considerations and geographical factors. You can purchase the complete Solar PV Balance of System (BOS) Markets report today by clicking here.